Nowadays, what entertains kids is a lot different from what we used to be entertained by. There were no iPads or iPhones with constant content to stream with an endless internet connection. And because of this, kids today require a lot more stimuli to satisfy their attention. How could you possibly overcome unlimited amounts of games, music, movies, and more at their fingertips? Easy. It takes a special place to take kids out of that virtual online world and into the real one. That place is Jump N Land. Are worried your kid is spending way too much time staring blankly into a screen? Then its time for something vibrant and colorful that sparks immediate excitement. No need to plan since Jump N Land’s Open Play Special lets your enter our massive Indoor Inflatable Palace any day of the week. No other Inflatable Play Zone in Sherman Texas can provide the level of pure enjoyment that Jump N Land can. Your child will forget whatever electronic device is in their hands the second they enter Jump N Land’s Inflatable Play Zone. 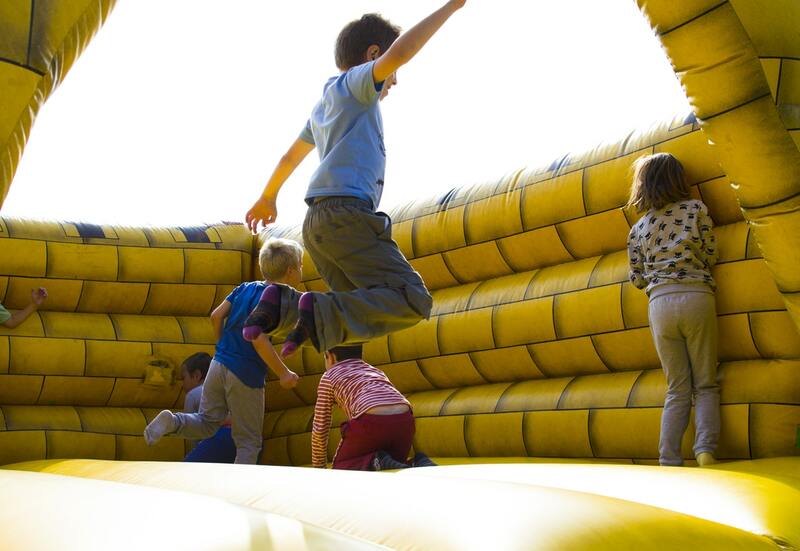 Our indoor bounce houses and interactive games will have your kid exhausted with fun. What better way to let your child enjoy an outdoor activity indoors with cool A/C and delicious food. The second your child enters Jump N Land’s doors, the delight and wonder in their eyes will light up. Watching your child play with an uncontrollable excitement is priceless. Especially since playing at Jump N Land is also safe and beneficial to their health. But as parents, we keep that a little secret. Our fantastic Open Play Special lets your child play for hours. They will be begging to come back over and over again everytime they leave. Our indoor bounce houses give parents the peace of mind knowing their child is getting a lot of physical exercise while having fun. Your child will also create lasting memories interacting with other children their age. The opportunity to share hours of fun and exciting moments with others is the best way to create close friends. Getting your child to power down and unplug their devices is so much easier when you have something vibrant and exciting to offer them. Our indoor inflatable bounce houses fit the bill perfectly. At Jump N Land, your child will immediately turn off their electronic devices and dive right into the fun. Nothing beats playing in real life especially in an indoor inflatable party zone. With our Open Play special, there is no need to wait for a special occasion to experience the fun. Contact Us today at (903)-892-4350 and let the fun begin.